Students remain a vital part of widening access work and their support with a range of initiatives has a huge impact on the learners with whom they interact. Many student unions are already carrying out innovative work to widen access but widening access practitioners in higher education institutions (HEIs) must look to support their endeavours and work in partnership with them thus ensuring a coherent approach. 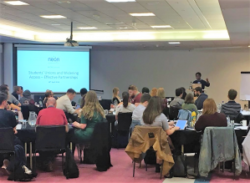 On 18th April 2018, Students’ Union Managers, Students’ Union Officers, Heads of Widening Participation, Widening Access Practitioners and Student Volunteering Managers came together for NEON’s Student Unions and Widening Access Summit hosted by the University of Manchester. This one day summit looked to facilitate discussions between student unions and widening access practitioners to facilitate discussions between Students’ Unions and widening access practitioners. Delegates heard keynotes from the likes of Amatey Doku, Vice President (Higher Education) of the National Union of students (NUS) who addressed ‘What more needs to be done in Widening Access’, and Jessica Woodsford from the Office for Students who shared valuable insights on the opportunities for student engagement within Access and Participation Plans. Representatives from the Kings College also shared a case study on the practice model of collaboration employed by Kings College London Widening Participation Department and Kings College London Student Union. Additionally Breakout sessions facilitated by the University Of Manchester Students Union (UMSU) provided an opportunity for delegates from SU’s and HEI Widening Participation teams to share best practice and explore the benefits of working in partnership to achieve the shared goal of equality of access.